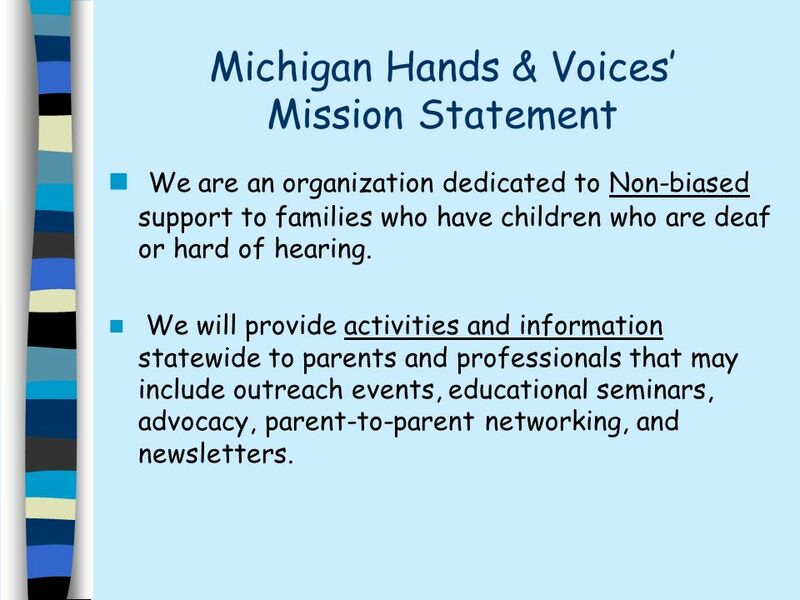 10 Michigan Hands & Voices Mission Statement We are an organization dedicated to Non-biased support to families who have children who are deaf or hard of hearing. 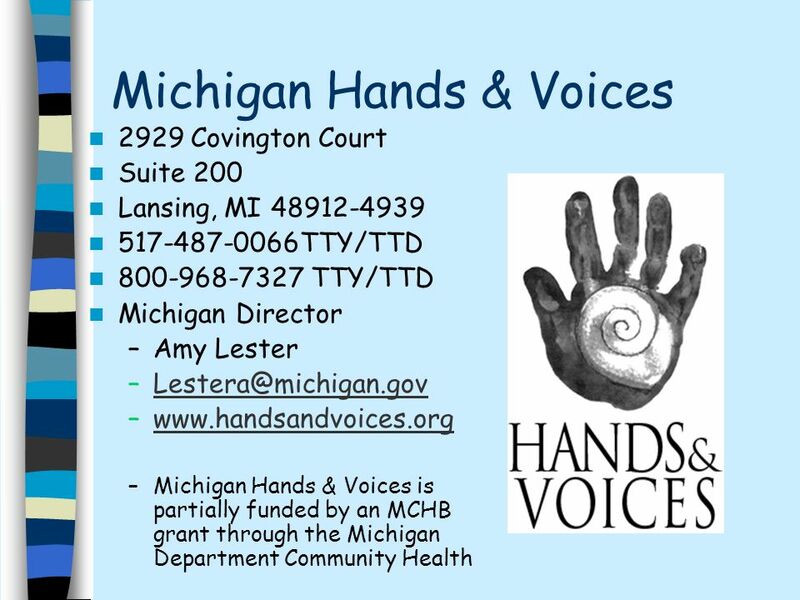 We will provide activities and information statewide to parents and professionals that may include outreach events, educational seminars, advocacy, parent-to-parent networking, and newsletters. 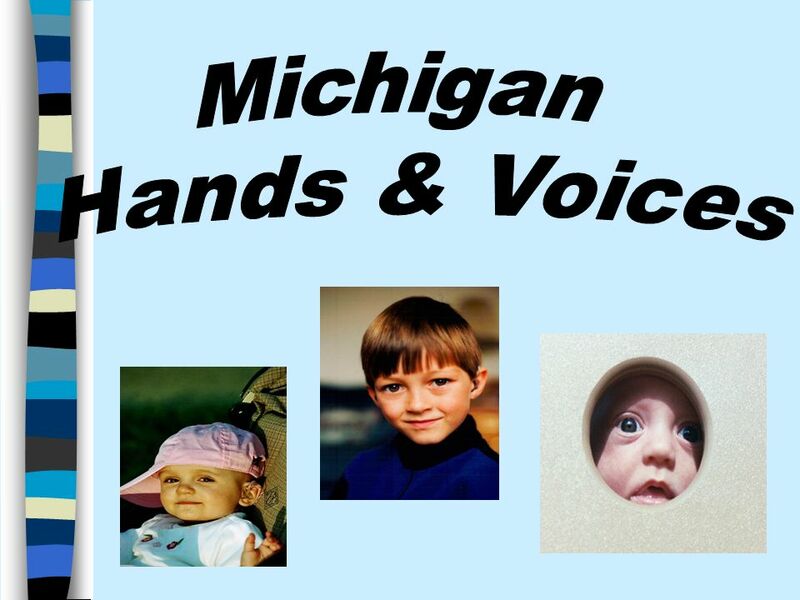 11 Michigan Hands & Voices Mission Statement We believe that families will make the best choices for their child if they have access to good information and support. 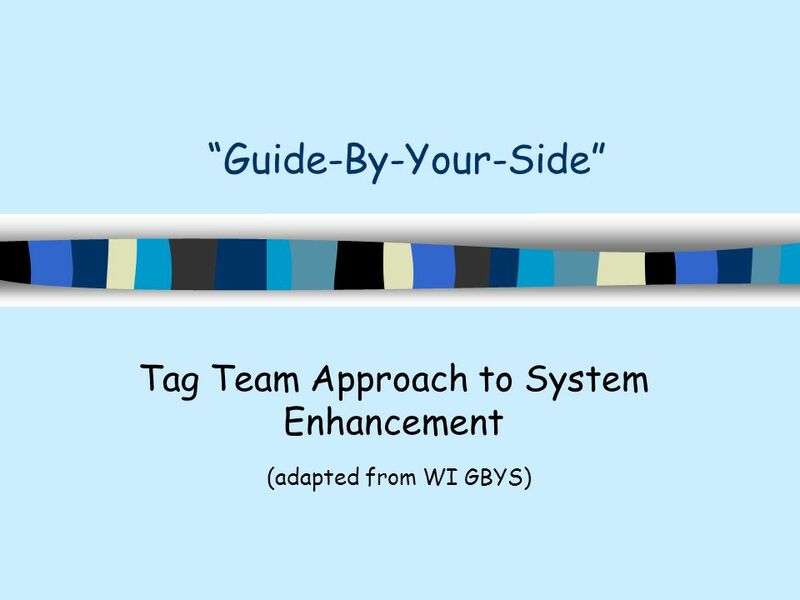 Our organization represents people who use varying approaches to communication and assistive technology. 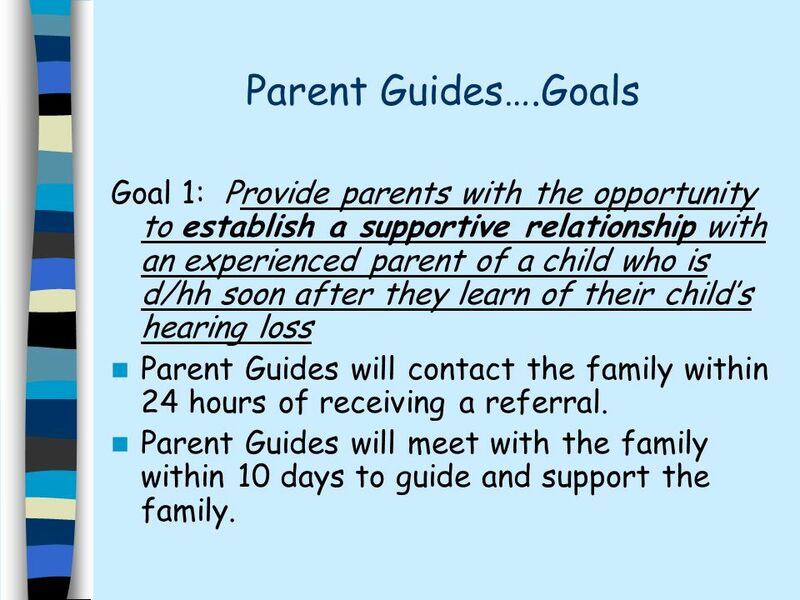 23 Parent Guides….Goals Goal 1: Provide parents with the opportunity to establish a supportive relationship with an experienced parent of a child who is d/hh soon after they learn of their childs hearing loss Parent Guides will contact the family within 24 hours of receiving a referral. 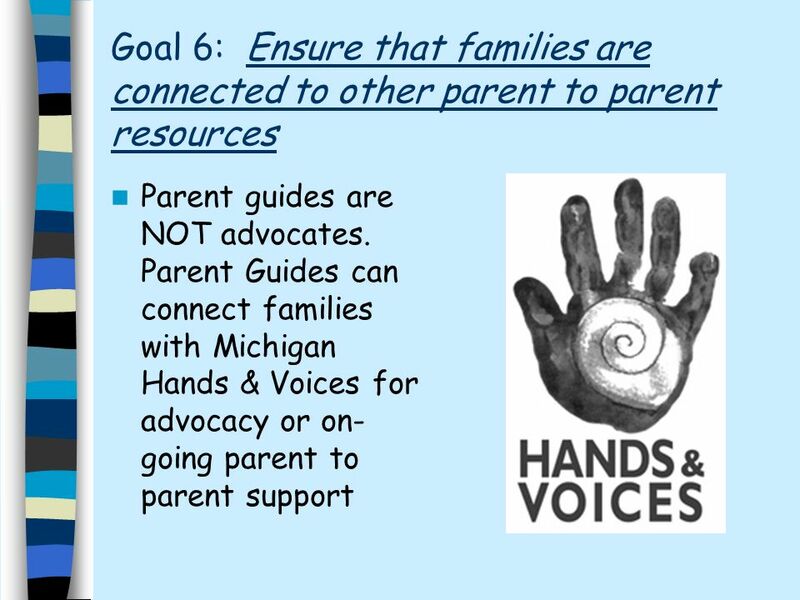 Parent Guides will meet with the family within 10 days to guide and support the family. 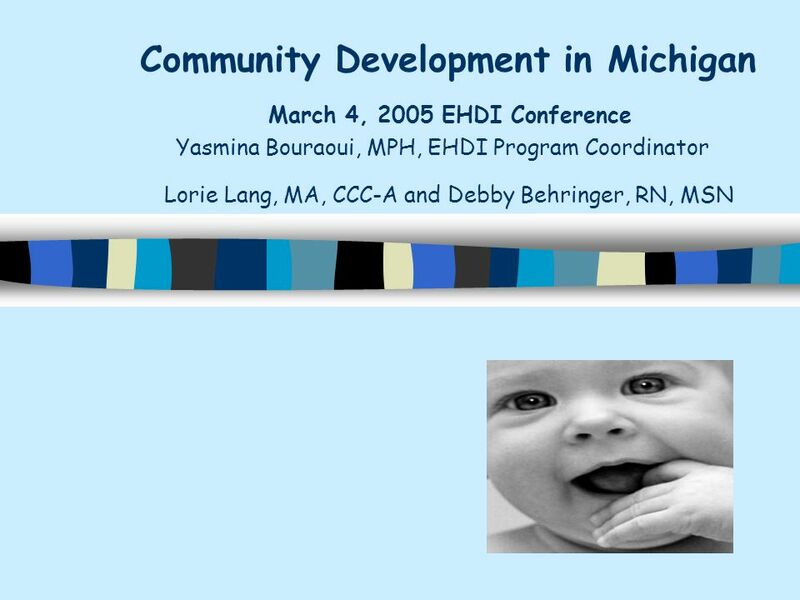 Download ppt "Community Development in Michigan March 4, 2005 EHDI Conference Yasmina Bouraoui, MPH, EHDI Program Coordinator Lorie Lang, MA, CCC-A and Debby Behringer,"
Health and Wellness for all Arizonans azdhs.gov Dr Bradley Golner, MD Phoenix Pediatrics Az EHDI Chapter Champion. 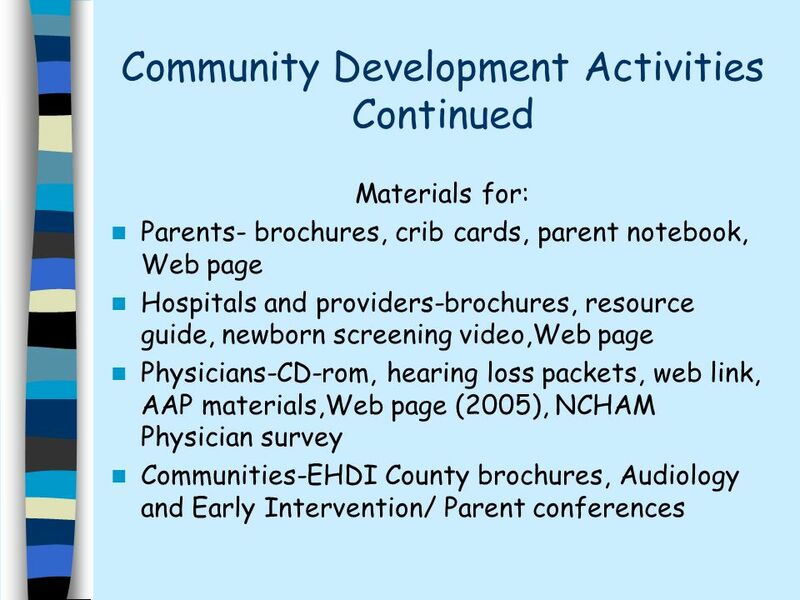 A National Technical Assistance System for Early Hearing Detection and Intervention Programs in the United States. 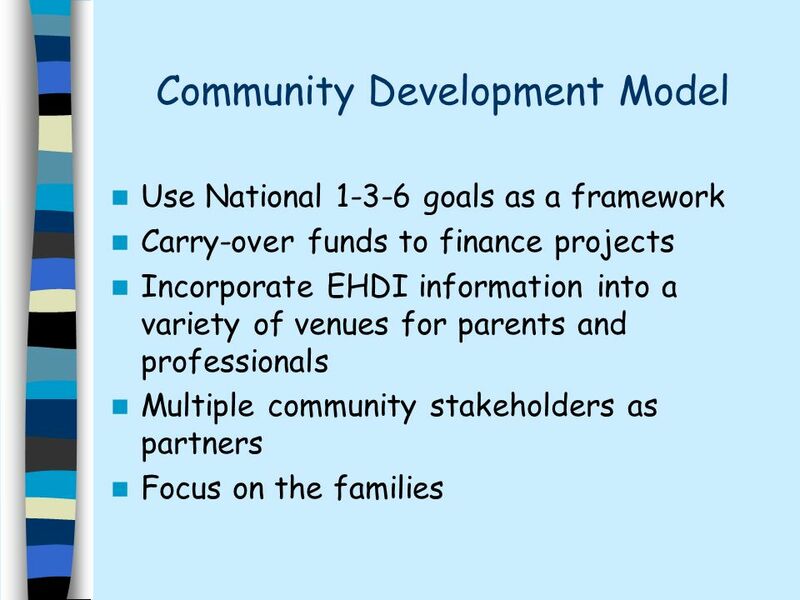 A National Technical Assistance System for EHDI Programs. 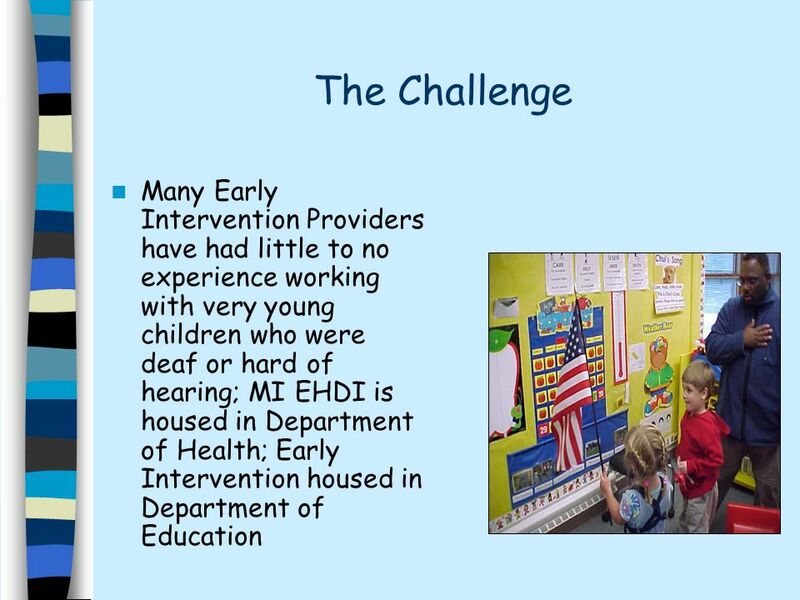 Texas Early Hearing Detection and Intervention Finding Lost EHDI Babies The Answer May Be Right in Front of You Doug Dittfurth Texas Department of Assistive. 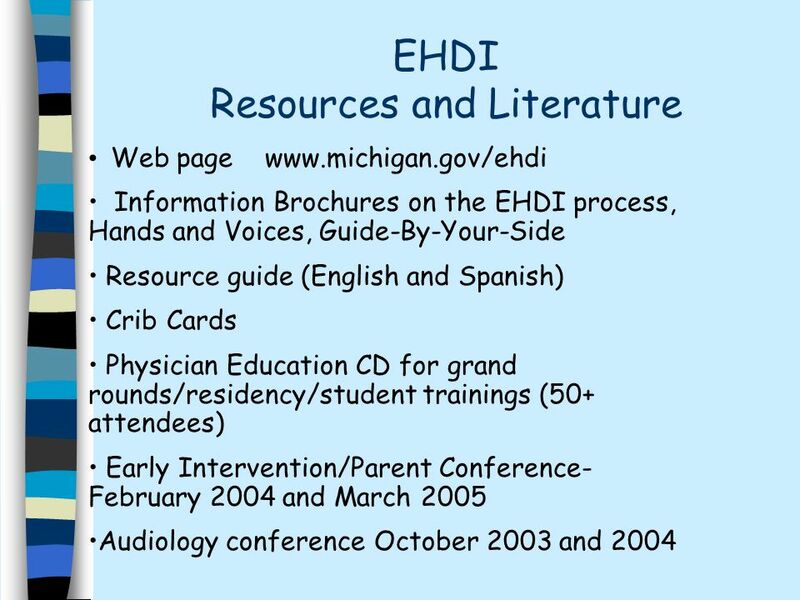 Using the Internet to Provide Targeted EHDI Education for Physicians Robert C. Cicco, M.D. 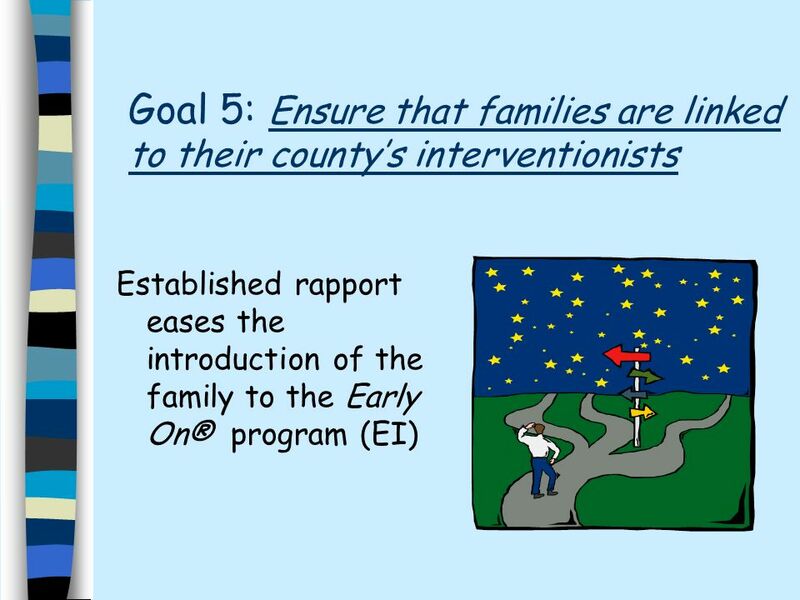 - Pediatric Advisor, PA EPIC-EHDI Program Neonatologist, West. 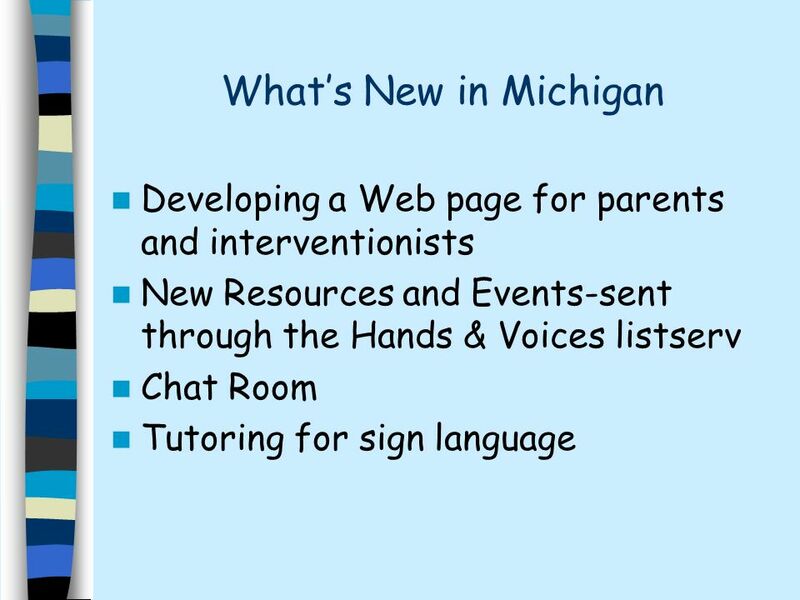 Wisconsins Innovative Parent Support Activities The Power of Parents n My daughter is eight years old and for the first time I dont feel alone. n I have. 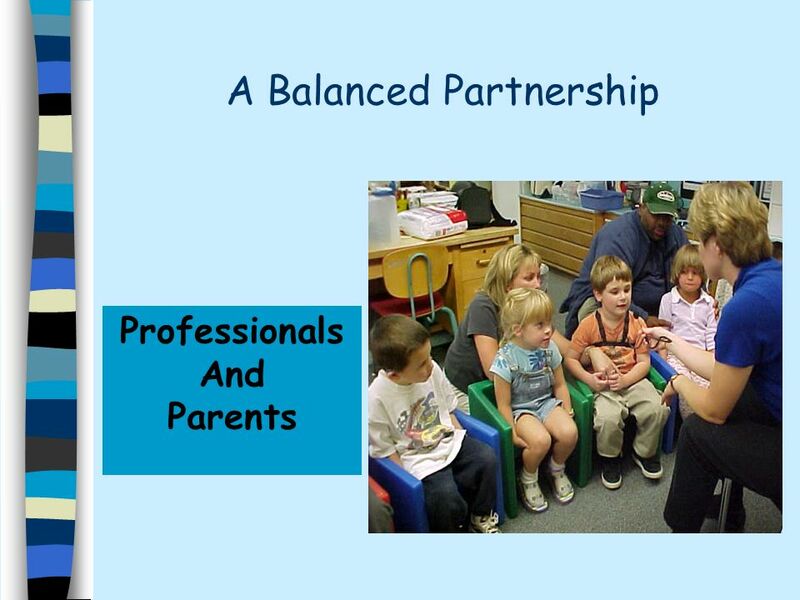 1 Early Contact with Parents: A Resource Kit for Parents and Professionals Janet Gilbert, Ed.D. 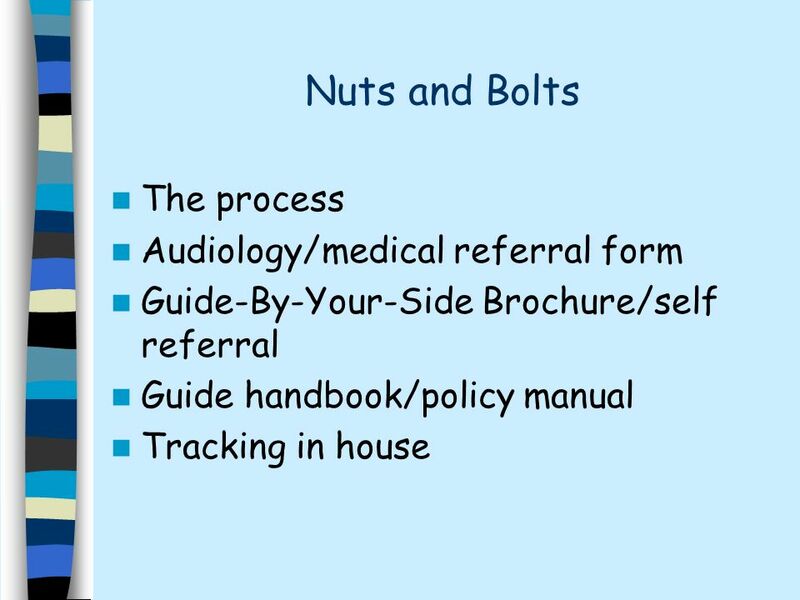 Mary Ann Lyon, MA, CCC/A Susan Swartz, MA, CCC/SLP EHDI. 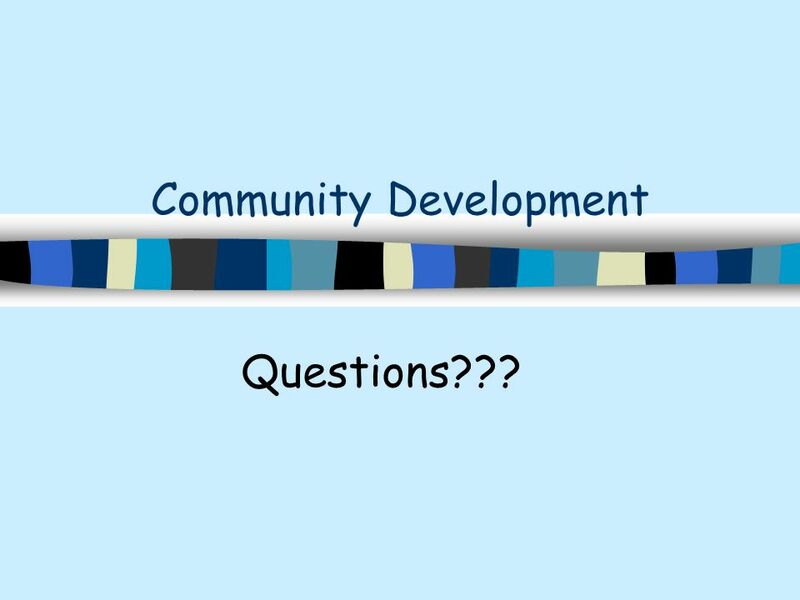 Outreach to Physicians Project Ohio Dept. 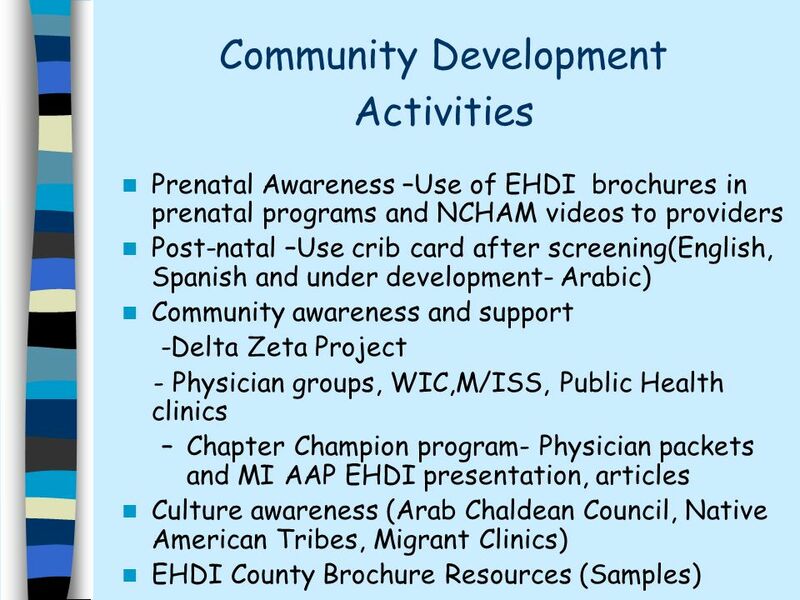 of Health with Delta Zeta Penny Baker, Ohio Sound Beginnings Coordinator Constance Block, Ohio Dept. of Health. 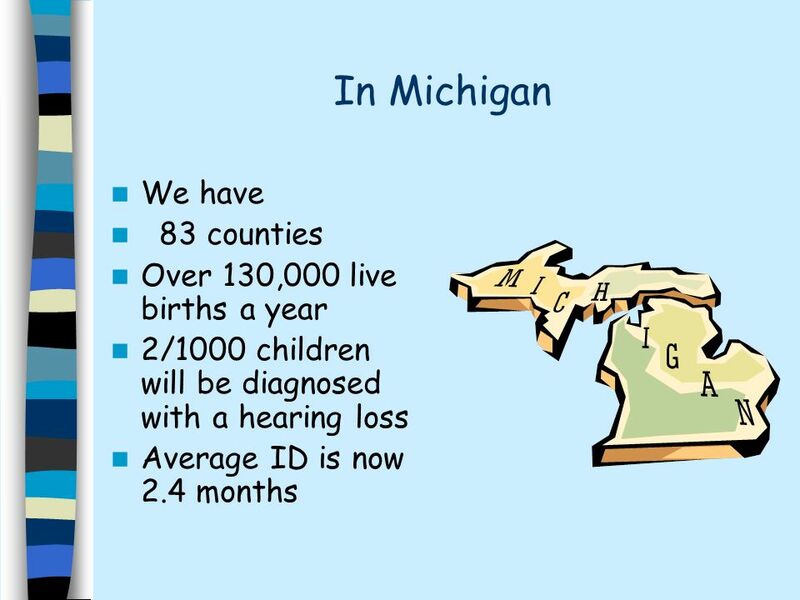 Indianas Universal Newborn Hearing Screening Program Weilin Long, M.A., M.P.A. 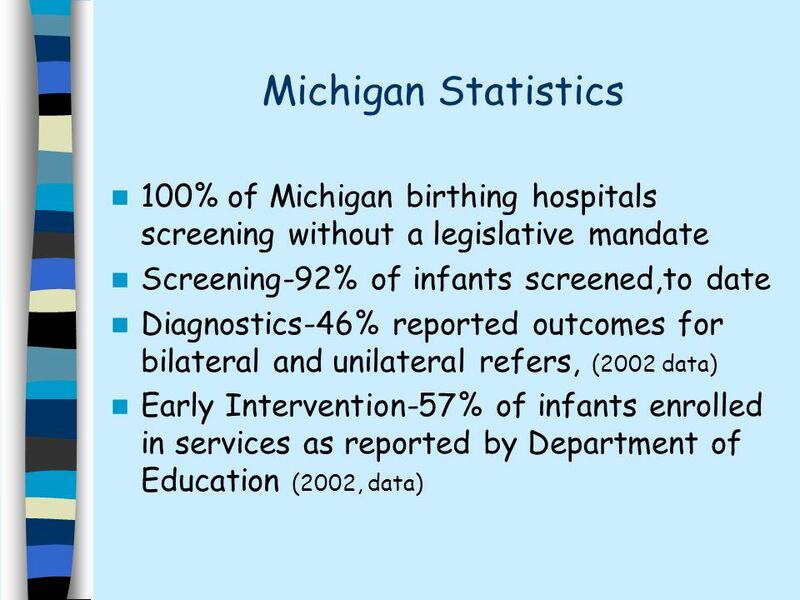 Indiana State Department of Health Newborn Screening Section. 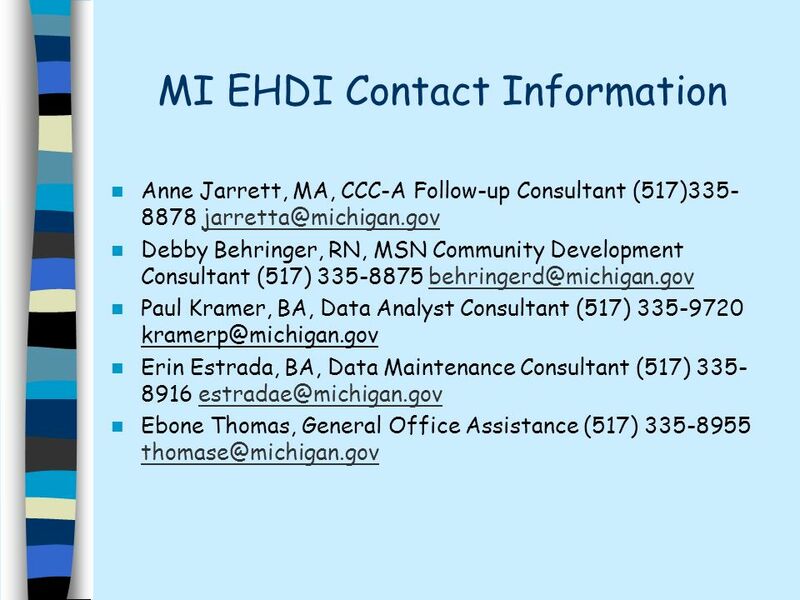 Engaging Audiologists in EHDI Data Systems Les R. Schmeltz, Au.D. NCHAM & Arizona School of Health Sciences Randi Winston, Au.D. 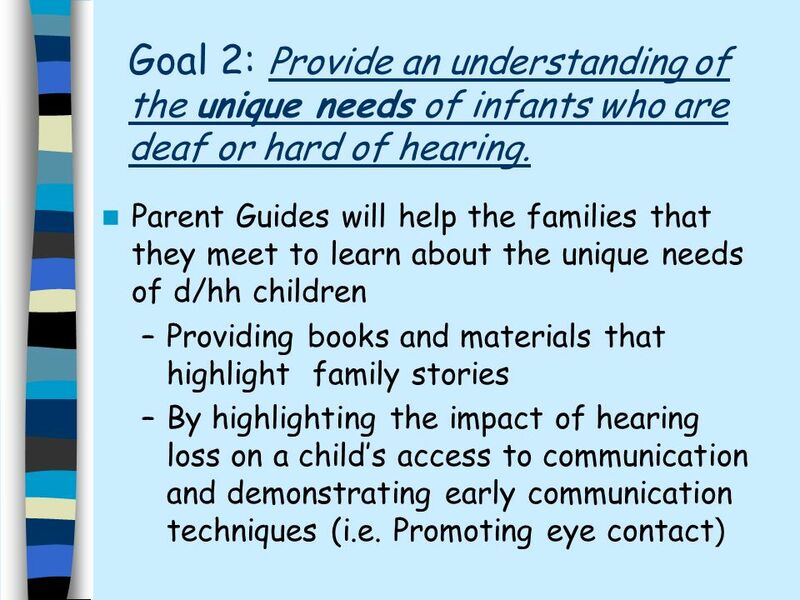 NCHAM & The EAR Foundation. 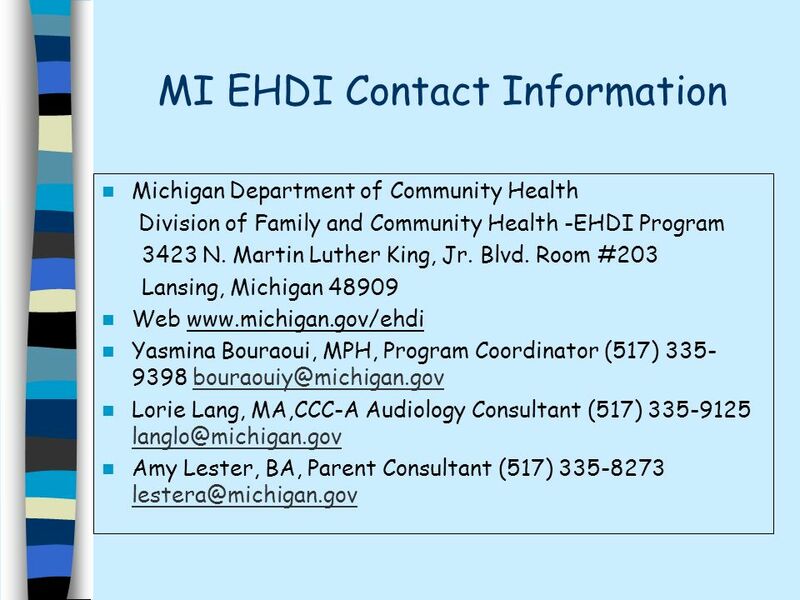 National Institute on Deafness and Other Communication Disorders (NIDCD) and EHDI Research Amy Donahue, Ph.D. Marin Allen, Ph.D. 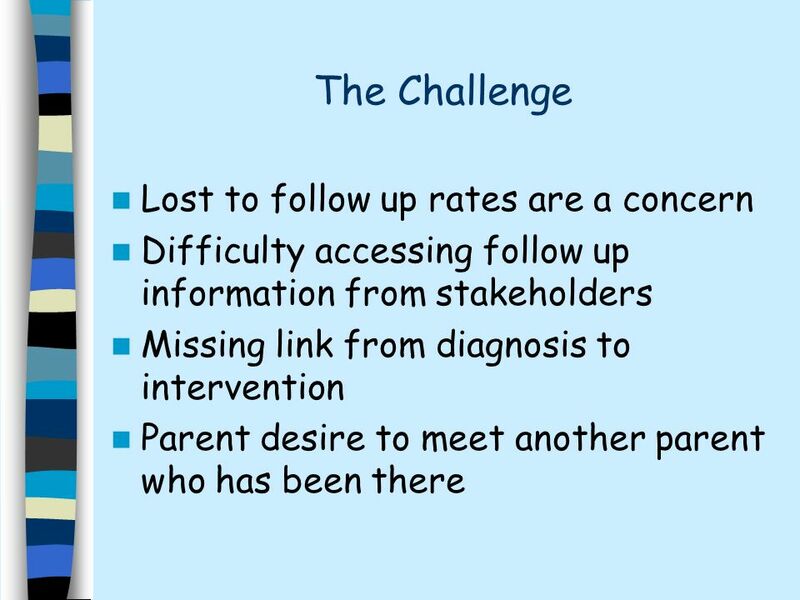 Opening Session: Collaboration is Key! 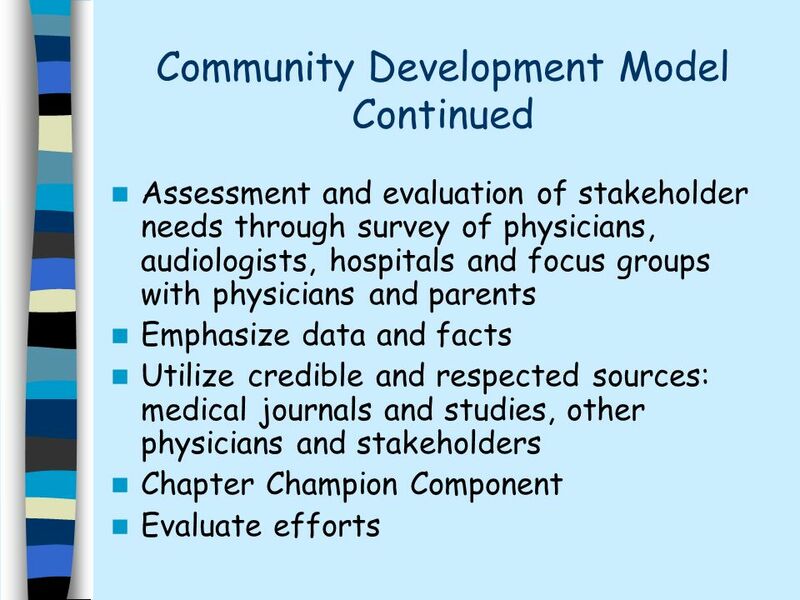 Kathryn Piziali Nichol, MD, FAAP American Academy of Pediatrics February 18, 2004. 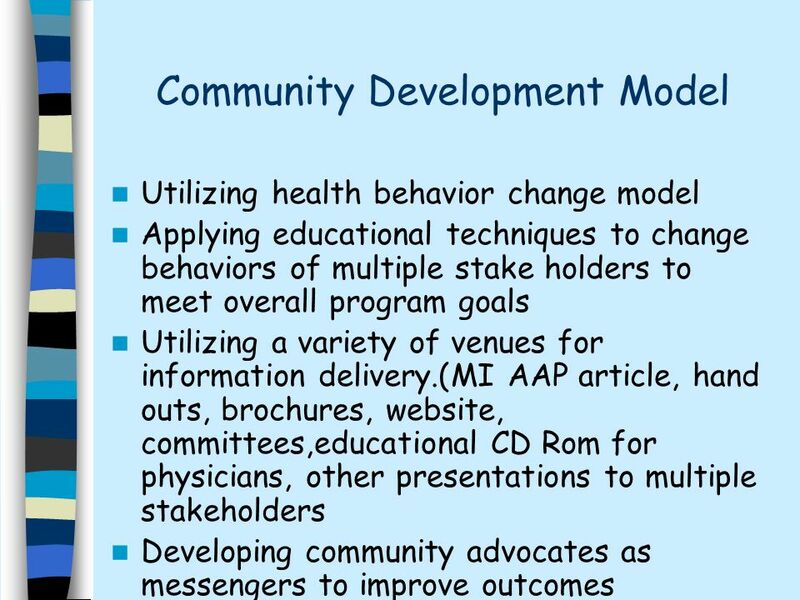 Arizona EHDI A Collaborative Approach. 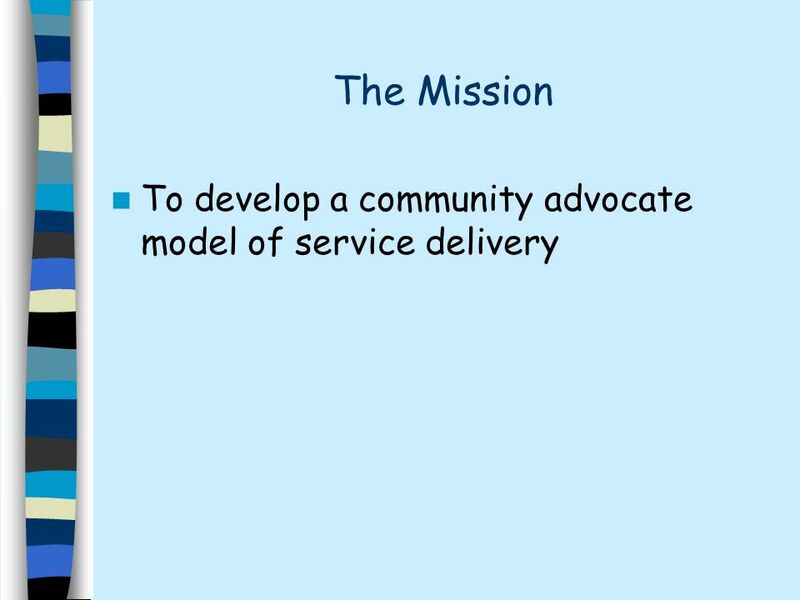 100% Voluntary 47 Hospitals.